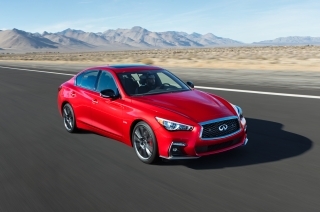 The INFINITI Q50, the brand’s best-selling vehicle globally, receives a significant update for the 2018 model year – including a refreshed exterior and interior appearance. As in previous years, Q50 continues to offer innovative technologies designed to empower and support the driver. Coinciding with the refreshed look of the Q50 one new exterior color, Mocha Almond, has been added to the color palette. 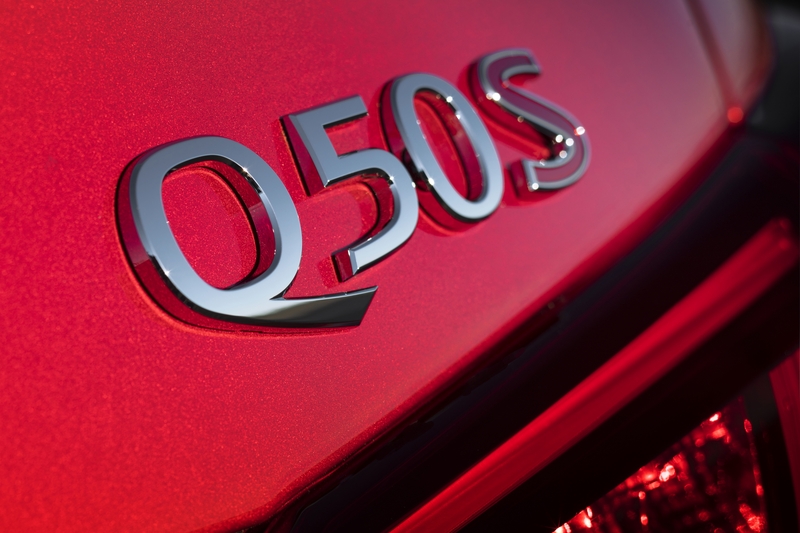 The Q50 continues to be available in four grades in Western Europe : Q50, Q50 PREMIUM, Q50 SPORT and Q50 SPORT TECH. 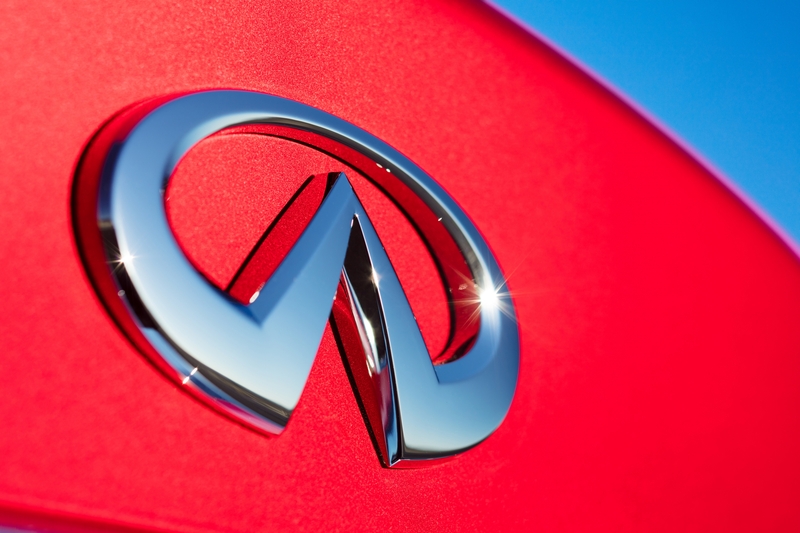 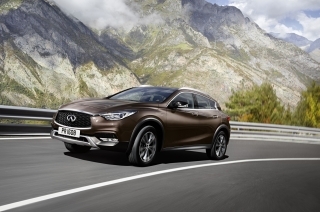 All models benefit from an update to INFINITI’s signature double-arch grille, which creates a strong first impression. 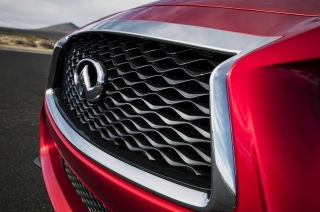 The grille's three-dimensional, textural quality has been enhanced with a deeper detailing of the waved mesh-pattern surface and chrome surround. Rising from the double-arch grille is a smooth and commanding character line, which flows energetically through the side of the body like a wave, creating a highly fluid profile – a trademark INFINITI look. 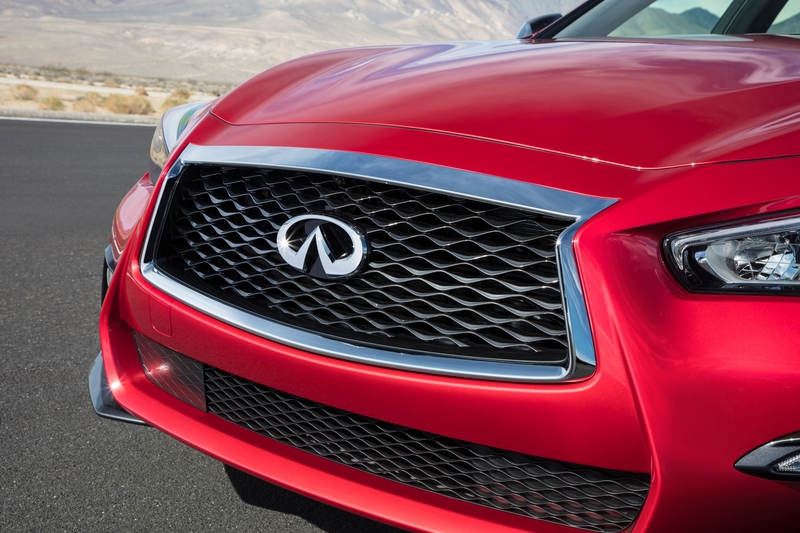 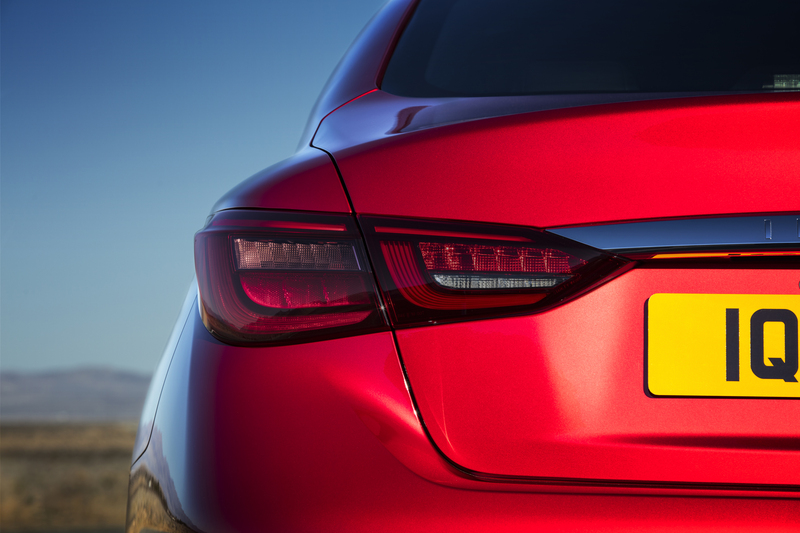 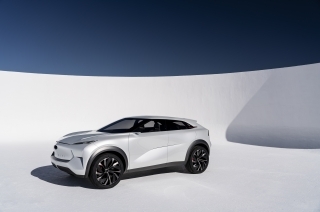 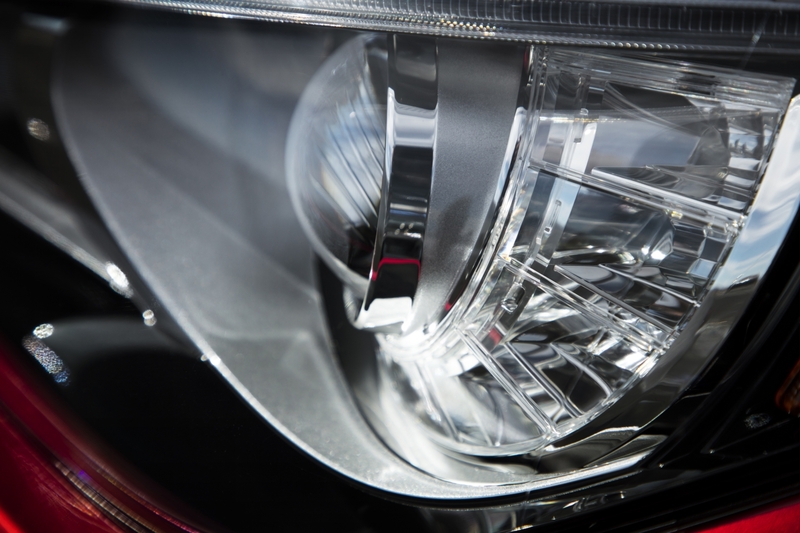 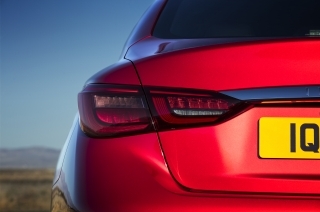 The designers also evolved INFINITI’s signature lighting at the front and rear of the car across all models. 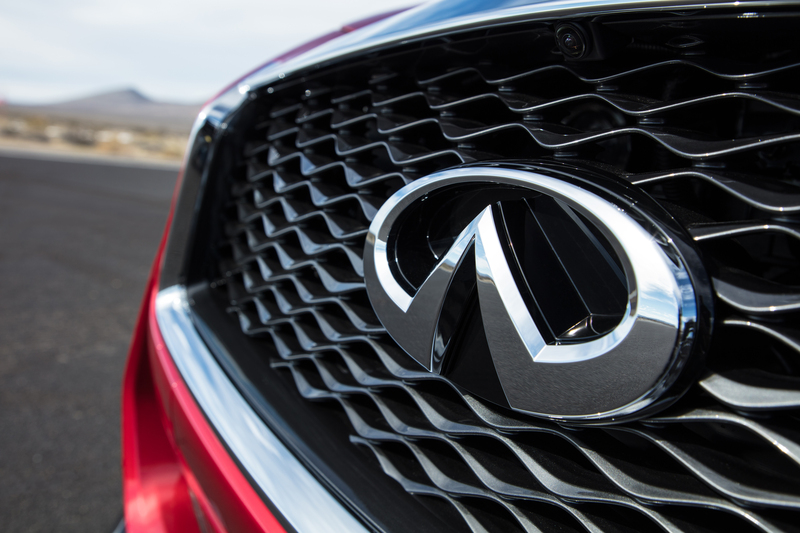 The LED headlamps enhance INFINITI’s trademark “human-eye” aspect, while new slimmer combination LED rear lamps, derived from the Q60 sports coupe, result in a more delicate appearance with a sharper light signature. 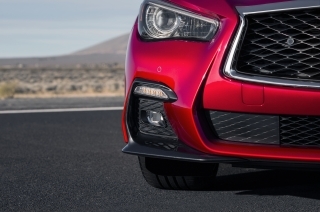 As in previous years, the Q50’s lean, robust body sides are designed to anchor the performance stance with a strong, solid “bone” and arched roofline that flows to the crescent C-pillars. In the rear, the side character lines smoothly merge with the shape of the rear LED combination lights. The familiar rear double-arch trunk line completes the strong, unforgettable view from behind. Heated outside mirrors with integrated LED turn signals are standard. 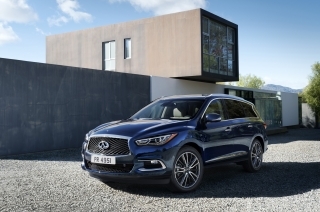 Other exterior details include a wide door architecture with narrow, roll-formed A- and B-pillar sashes that provide easy ingress and egress, as well as an open cabin environment. 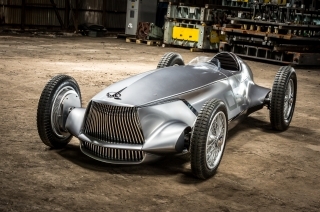 The body design also offers excellent airflow over both the upper and lower body portions, resulting in a coefficient of drag as low as 0.26 (varies by grade level and drive configuration). 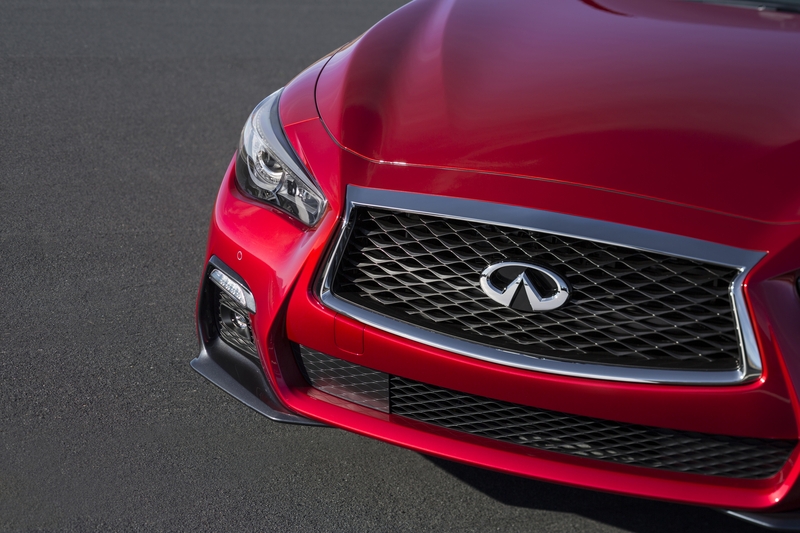 The Q50 also features a close to zero front and rear lift. 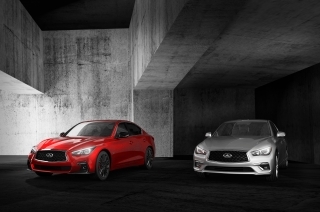 The color palette has been specially selected to accent the Q50 contours and sculpted surfaces and includes a range of 10 colors: Midnight Black, Liquid Platinum, Graphite Shadow, Black Obsidian, Dynamic Sunstone Red, Moonlight White, Pure White, Hagane Blue, Iridium Blue and new Mocha Almond. 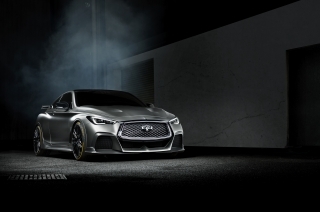 With the new 2018 Q50, INFINITI designers seized the opportunity to tailor a different design according to the attributes and character of the SPORT and SPORT TECH models. 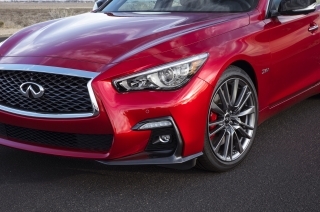 It adds performance-focused exterior design with further enhancements, which lets drivers express themselves with a more assertive design that clearly conveys the car’s performance potential. 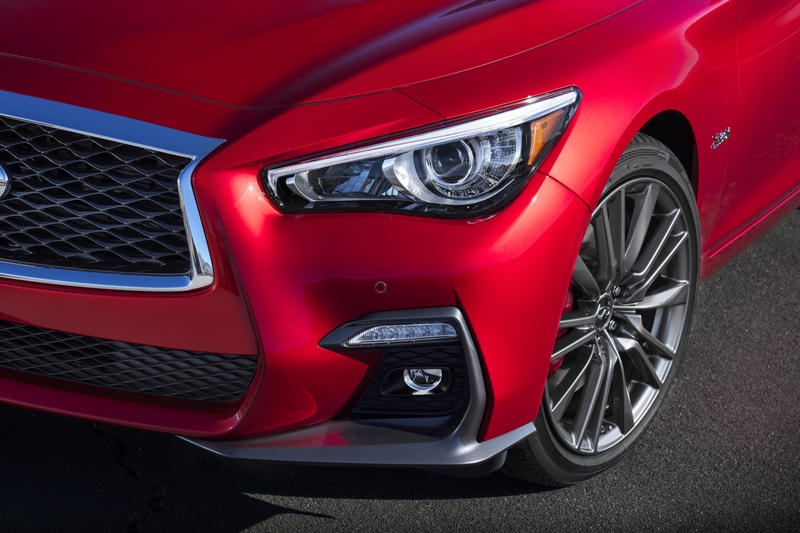 Design changes at the front of the Q50S SPORT and SPORT TECH versions include a more angular front bumper and wider, lower air intakes – adding greater visual potency. 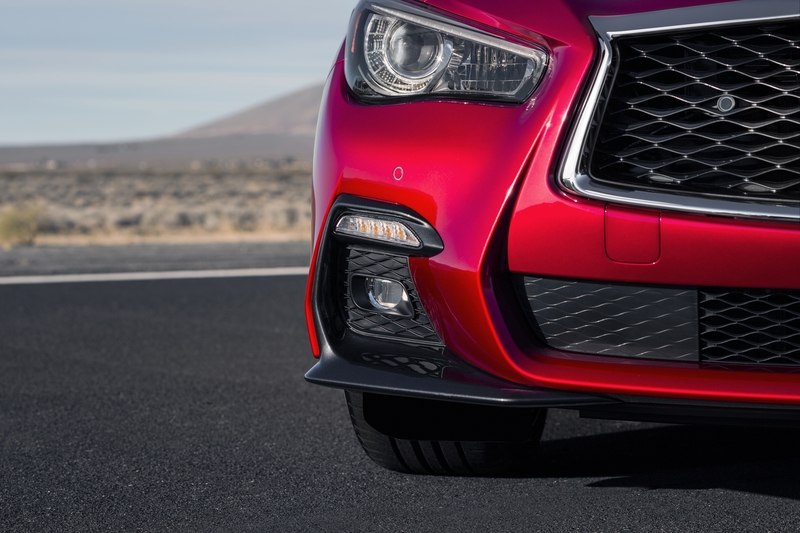 Inspired by INFINITI’s “zero lift” approach to aerodynamic efficiency, the new Q50 boasts a more prominent airfoil at the base of the front bumper. The rear of the Q50S SPORT and SPORT TECH models places more focus on the twin exhausts and rear diffuser with a two-tone paint finish – the body color is accompanied by dark metallic trim around the base of the rear bumper. A power sliding and tilting glass sunroof is standard on all SPORT Tech models. 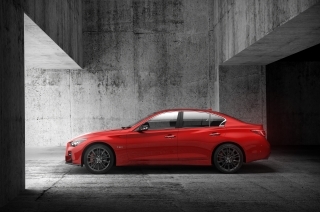 The Q50S SPORT and SPORT TECH models with the 3.0t engine come equipped with unique 19-inch wheels and red brake calipers, contributing to a more aggressive stance, while also improving handling and traction under cornering and hard acceleration. The aluminum alloy wheels fitted convey a more technical aspect in their design with sharper, thinner spokes than those of the other SPORT and SPORT TECH models. 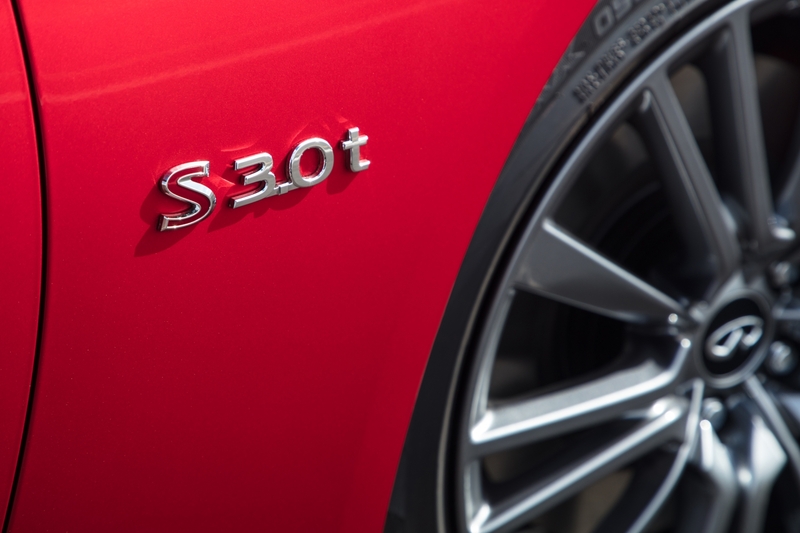 The 3.0t version is further distinguished with door mirrors finished in high-gloss black paint, red “S” badging and unique exhaust tips, adding to the car’s confident look. 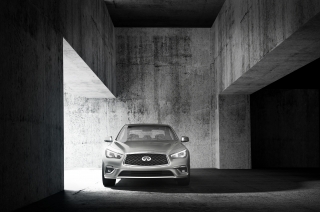 Inside the new 2018 Q50, INFINITI has introduced an enhanced level of artistry and quality to the high-tech cabin, providing a comfortable and connected space. 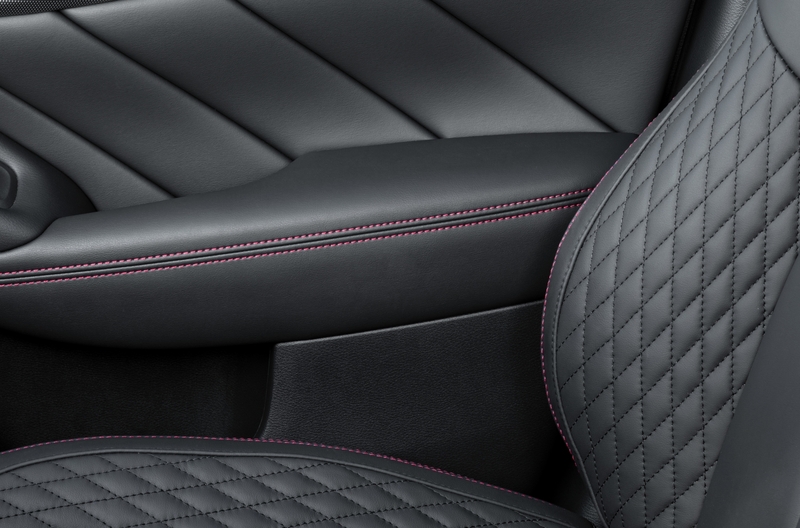 Greater levels of craftsmanship are central to the interior design modifications. In particular, leather-like materials now surround the instrument panel and are now finished with double stitching. 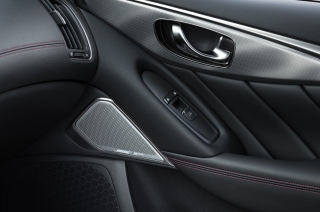 The Kacchu Aluminium interior trim is now standard on the Premium grade of the new Q50. 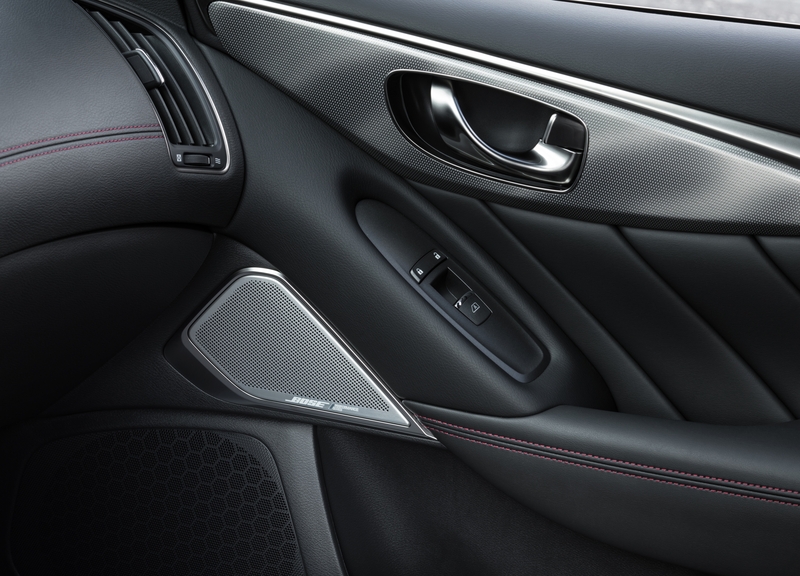 It upgrades the touch and feel of the dashboard as well as the doors of the vehicle. 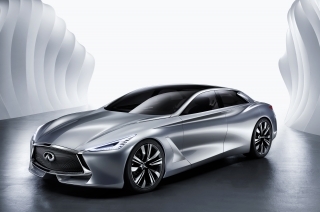 INFINITI designers have also incorporated the performance-inspired ethos inside the cabin, derived from the Q60 sports coupe. 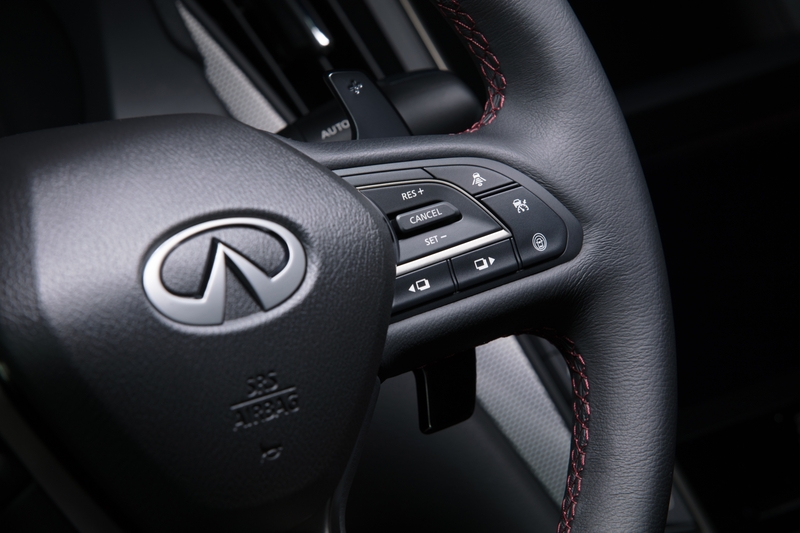 A new steering wheel features molded positions for the driver’s thumbs and affords intuitive fingertip access to reshaped steering wheel-mounted gear-shifter paddles. 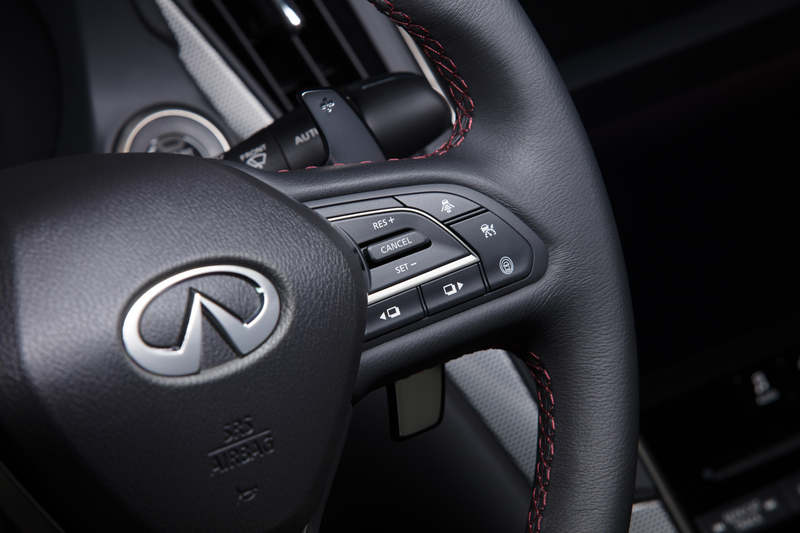 A new performance-oriented leather-wrapped shift knob – like the instrument panel, also bearing double-stitched seams – is surrounded by new chrome trim and features an inlaid INFINITI logo. The 2018 Q50 interior features INFINITI’s hallmark spinal support seats – carefully engineered to provide a consistent level of support and minimize pressure on lower and upper back muscles. Both the front and rear seats help distribute body pressure across a wider range of the upper seating surface. 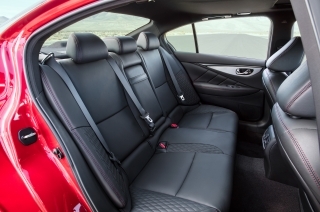 The roomy interior space offers ample front and rear headroom, ample rear knee room enhanced by the thin front seatback design, and greater front seat slide and lift adjustability. 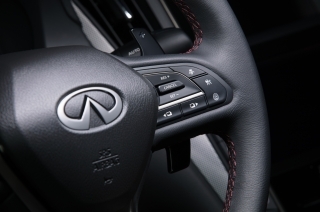 The Q50’s instrument panel honors INFINITI’s “double wave” design tradition, while updated with an asymmetrical flow from the top of the center cluster to the wide center console. Access to all key operations and controls is designed so that the driver does not need to change driving posture, including use of hard switches, touch panels, INFINITI Controller and INFINITI Drive Mode Selector. 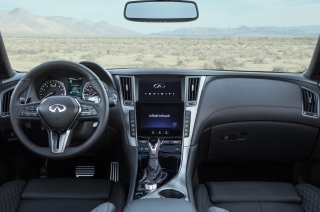 At the heart of the center console is INFINITI’s InTouch™ Services, bringing the future of in-car connectivity to the interior of the Q50. 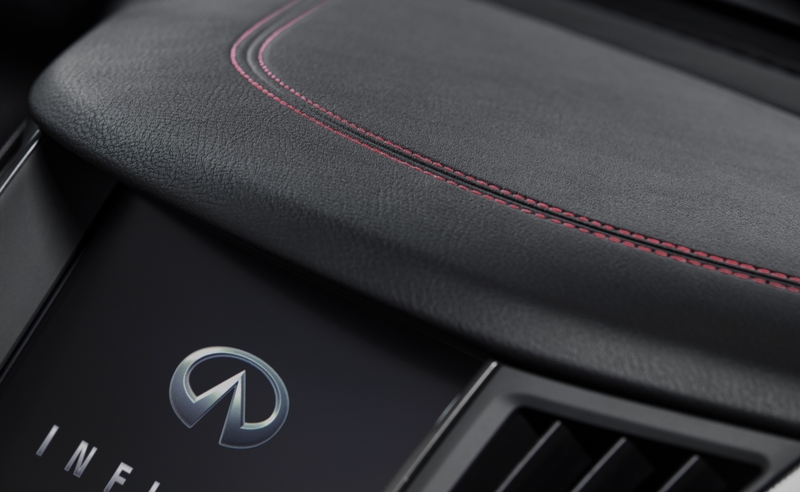 Unlike conventional interfaces, the Q50 has two touch-capacitive color screens (LCD/VGA 8-inch upper and 7-inch lower). 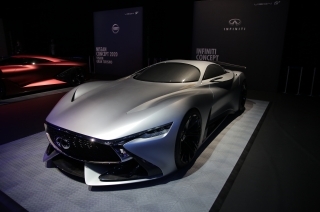 The system is designed to effortlessly synchronize car and driver – content and functions directed to the upper screen include the most frequently viewed applications, such as navigation, while other content is directed to the lower display screen for easy access. 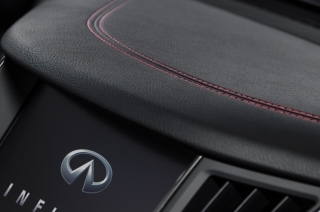 InTouch™ allows occupants to personalize the interior environment of the Q50 according to their preferences, and can store profiles for multiple drivers, identified by their I-key (intelligent key). 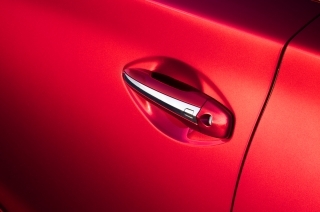 This includes an easy entry and exit assist system. 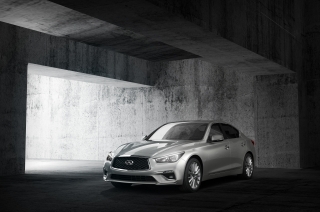 Based on the profile detected on the I-key, the Q50 moves the driver’s seat to the most rearward position and the steering wheel up and out of the way for comfortable ingress or egress, before automatically returning both to the custom memory setting. The Q50 offers an available 16-speaker, Bose® Performance Series sound system. Featuring advanced staging technology, the signal processing algorithm designed especially for this system delivers a precise, rich and nuanced acoustic experience for driver and passengers. 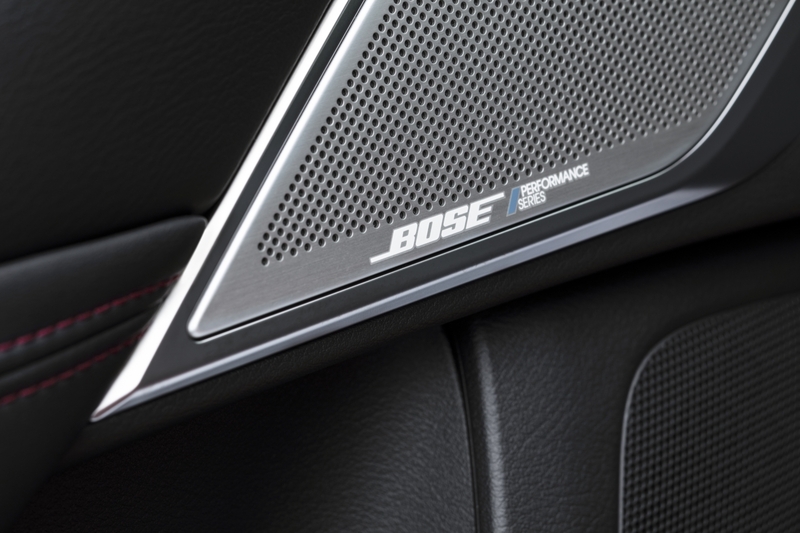 Bose®’s CenterPoint 2.0 software enables listeners to enjoy a surround-sound experience from any stereo source. It has been specifically engineered to meet the unique demands of reproducing surround sound in the sedan. Other features include Dual-Zone Automatic Temperature Control, Bluetooth® Hands-free Phone System, RearView Monitor and available Advanced Climate Control System with Plasmacluster® air purifier. 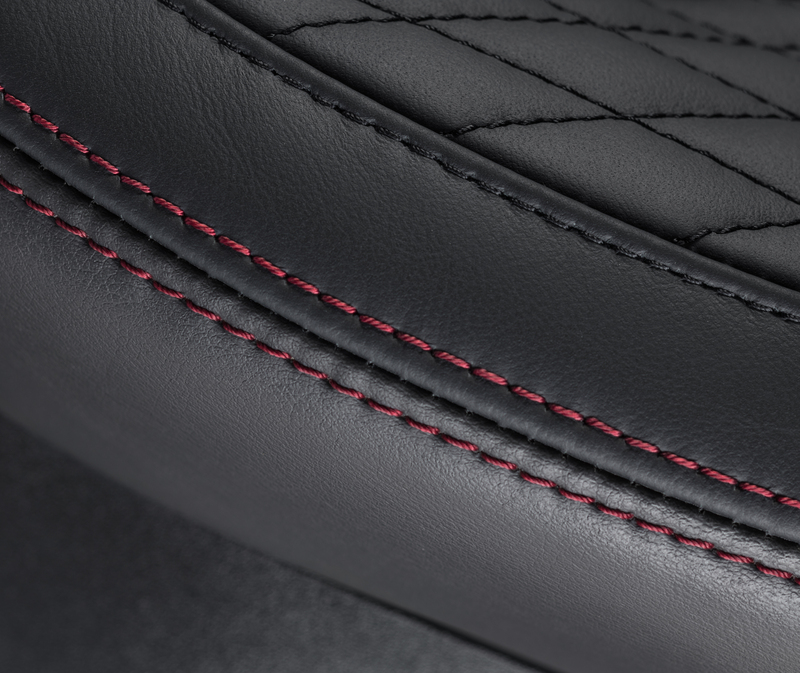 The 3.0t models are further differentiated with semi-aniline quilted leather-appointed seats, red stitching throughout the cabin and quilted side inserts on the seats, as well as sporty, yet simple, dashboard dials with dark chrome finish. The adoption of more technical materials accentuate the car’s performance potential, such as matte dark chrome on the doors and a black headliner for a more focused and cocooned interior. The 2018 Q50 builds on the long list of safety, security and driving aid technologies already found in other INFINITI models. 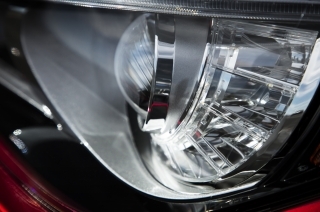 Among the available systems are Around View® Monitor with Moving Object Detection, Intelligent Cruise Control with Full Speed Range, Forward Emergency Braking, Distance Control Assist, Blind Spot Warning, Blind Spot Intervention®, Backup Collision Intervention®, Lane Departure Warning, Lane Departure Prevention with Active Lane Control™, Adaptive Front lighting System, High Beam Assist technology and Predictive Forward Collision Warning. Waiting behind the Q50’s signature double-arch grille and wide hood is a choice of four advanced INFINITI powertrains. Leading the quartet of powerful options is the exclusive “VR-series” 3.0-liter V6 twin-turbo engine, which was recently named to the prestigious 2017 Ward's 10 Best Engines list. It delivers 405ps and is a more than worthy successor to the renowned, highly awarded “VQ-series” V6 that has been a mainstay of INFINITI performance models for many years. 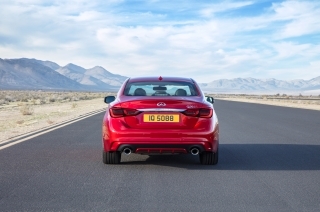 This VR-series engine was developed to provide an ideal mix of drivability, efficiency and performance. While smaller in capacity than the previous 3.7-liter VQ V6, the VR adopts a series of innovative technologies to deliver a more engaging driving experience, including a direct-injection gasoline fueling system. 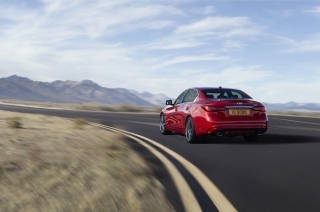 The high-pressure system allows for more precise injection of fuel into the combustion chamber, delivering the exact amount required for smooth engine acceleration, depending on throttle position and engine speed. This system makes the VR V6 the cleanest and most fuel-efficient engine of its type that INFINITI has ever offered. The engine also features lightweight aluminum construction and low mechanical friction – providing smooth, durable and highly responsive performance. 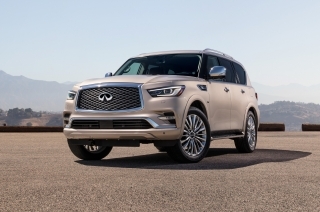 One key item among the engine’s weight-saving elements is the adoption of spray bore coating for the engine block and integrated exhaust manifold for cylinder heads. Not only does this make the engine lighter, but this also aids cooling as heat can dissipate more effectively. 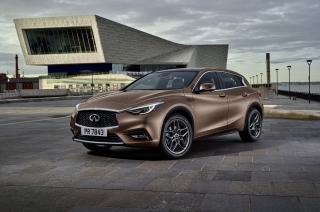 One of the engine’s many other significant features is the adoption of an integrated exhaust manifold, built into the cylinder head, which positions the catalytic converter closer to the exhaust point. This results in a shorter flow path for the hot exhaust gases, allowing the catalytic converter to heat up almost instantly – twice as fast as previous V6 engines – improving response, while also reducing emissions from a cold start. Moving the catalytic converter closer to the exhaust point also saves weight by making the engine more compact than before. 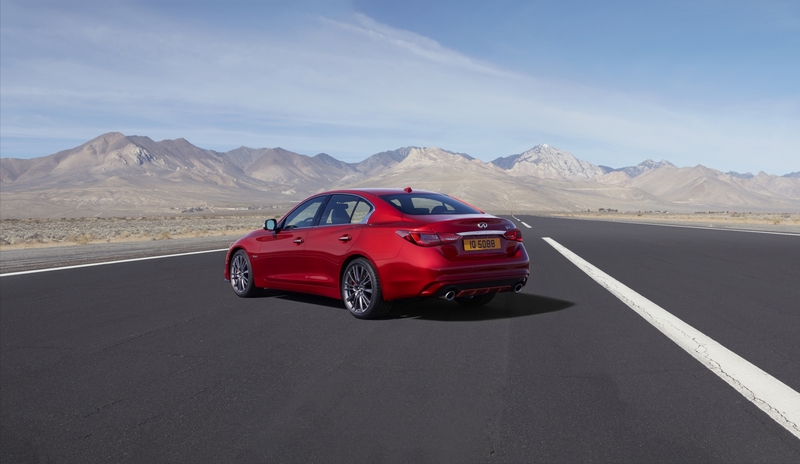 The VR-series’ power delivery is enhanced through an advanced twin-turbo system, which enables smooth and immediate responses under acceleration, while aiding efficiency. An optimized turbine blade design helps the engine generate greater overall performance, with faster turbine revolution speeds allowing for an immediate response from the twin-turbo system. 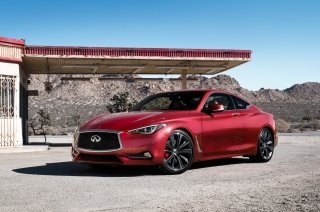 In addition, the engine features a turbine speed sensor, which allows for the twin-turbo system to perform at up to 220,000 rpm – at steady condition and 240,000 rpm at transient condition – higher than ever before for a V6 power unit. 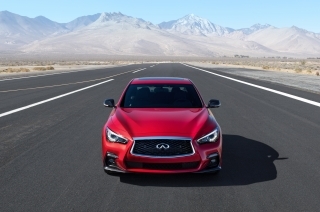 With greater capacity for faster revolutions, the twin turbochargers boost the engine to deliver higher power and torque. 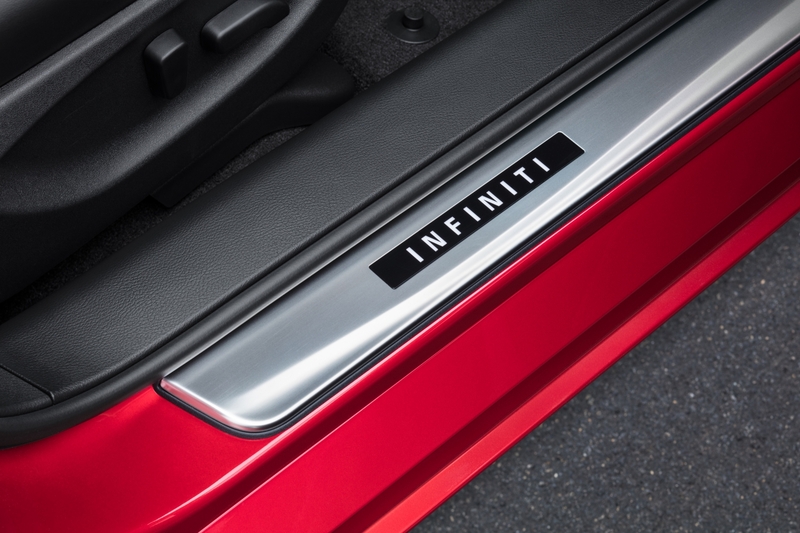 The engine also features a water-cooled intercooler system to further improve performance and efficiency. 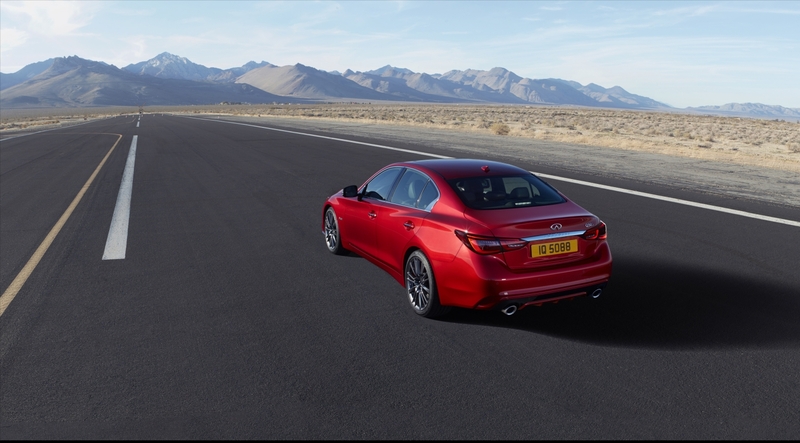 The system rapidly cools air as it enters the twin-turbo system, reducing turbo lag and allowing for more immediate acceleration. 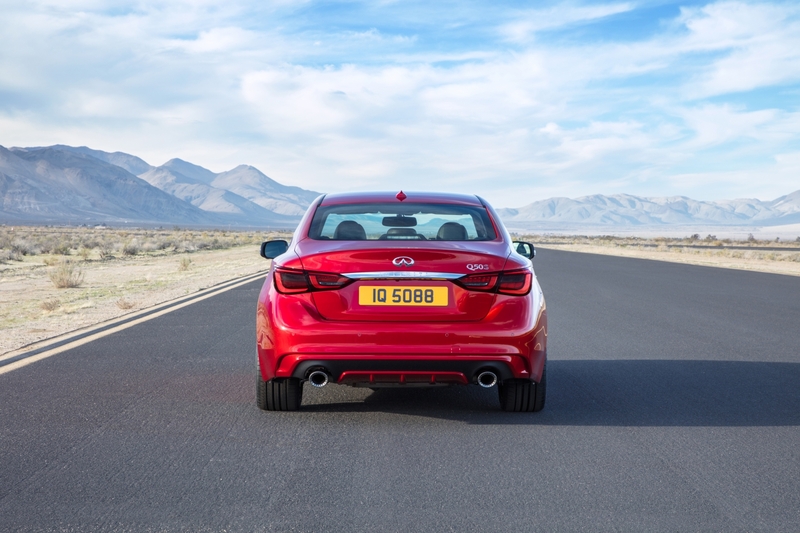 The secondary result is a cooling system that is more compact – meaning a shorter flow path for air entering the turbocharger to enable quicker engine response. 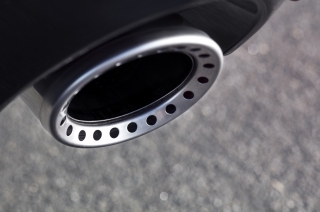 An electronic waste gate actuator allows closer control of exhaust gas flow away from the turbocharger, restricting the amount of exhaust gas flowing through the unit to improve overall engine efficiency. 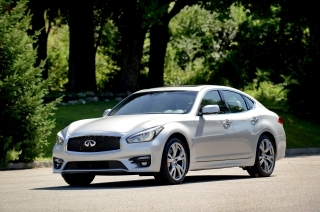 The 3.0-liter V6 delivers 405ps at 6,400 rpm, Torque is rated at 475Nm at 1,600-5,200 rpm. 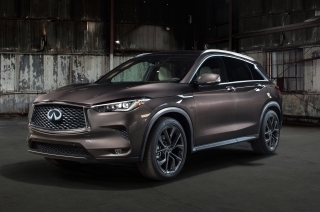 Complementing this high output version is a 2.0-liter four-cylinder turbocharged unit, rated at 211ps at 5,500 rpm, with peak torque of 350Nm available at 1,250-3,500 rpm. 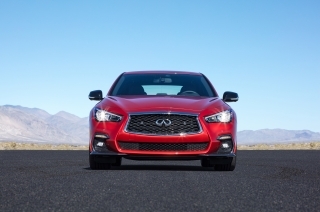 This engine, like the 3.0-liter V6, is engineered to blend responsive performance with enhanced fuel efficiency. 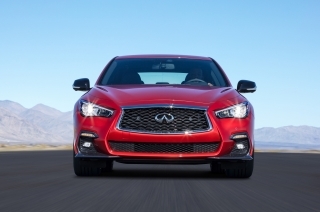 The 2.0-liter engine features a lightweight aluminum block and cylinder head with chain-driven dual-overhead camshafts, die-cast aluminum cylinder crankcase and optimized crank assembly promote further weight savings, reduce friction and improve efficiency. 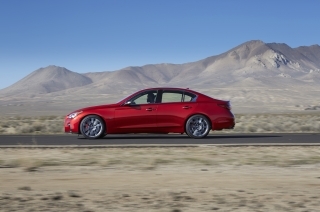 An idle stop-start system is standard with the 2.0-liter turbocharged engine. The third available Q50 powertrain is INFINITI’s advanced gasoline-electric hybrid, which features the Direct Response Hybrid® system. 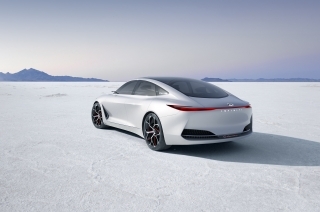 It combines a 3.5-liter 24-valve DOHC aluminum-alloy V6 and a compact laminated lithium-ion battery with an intelligent Dual Clutch Control, combining one motor and two clutches. 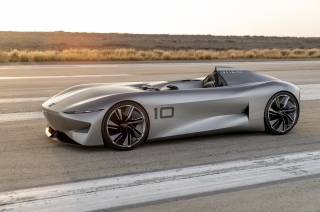 Thanks to this configuration the engine can be separated from the drive-train when necessary, the power source for both the engine and motor can be utilized optimally, resulting in more efficient driving. 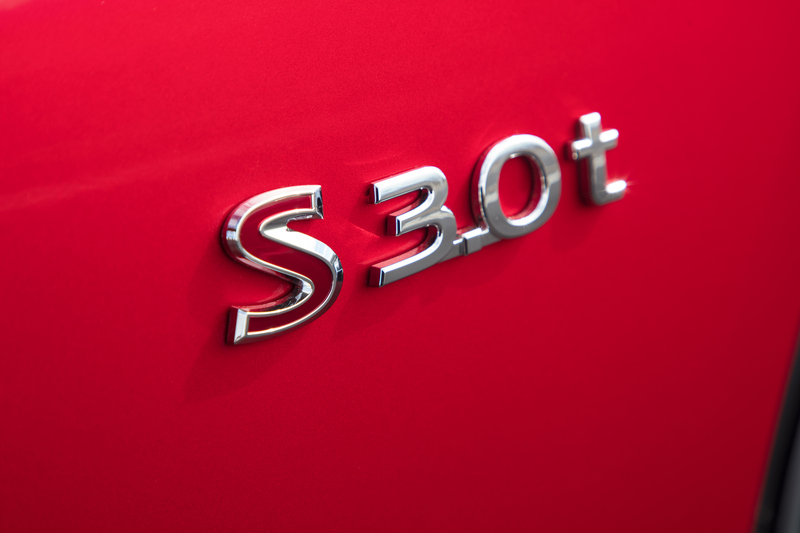 The system’s V6 is rated at 306ps and 350Nm of torque, while the advanced 50 kW electric motor is rated at 68ps and 270Nm of torque. 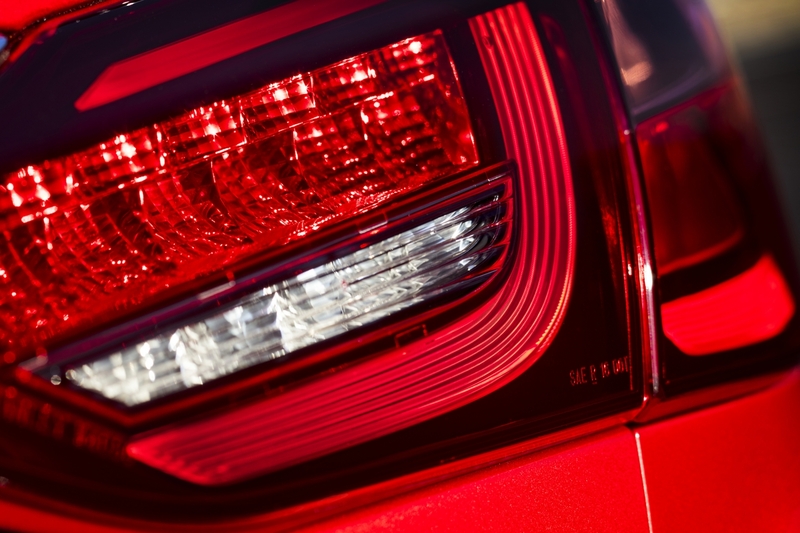 The hybrid system’s net power is 364ps, providing strong acceleration and lean fuel efficiency as low as 5.9l/100 km and 139gr CO2. 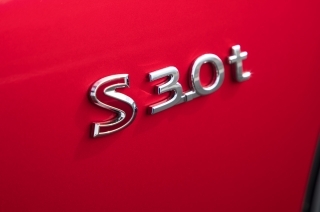 It takes full advantage of the electric motor’s instant torque for exceptional acceleration and, in combination with the 3.5-liter V6, provides an energetic feel under all driving conditions. 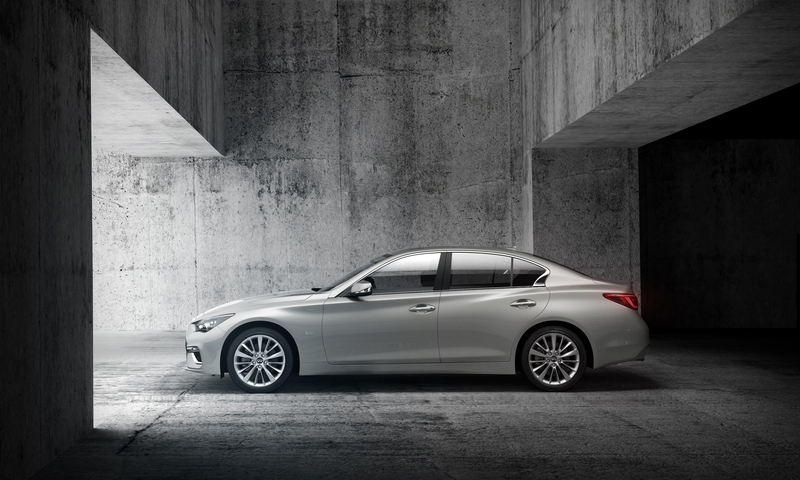 Being available from the Premium grade, the Q50 MY18 Hybrid becomes more affordable from now on. 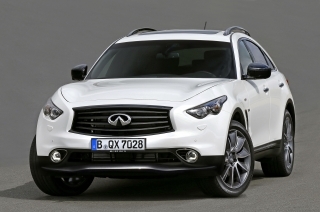 Additionally available is a 4-cylinder 2.2-liter direct-injection turbo diesel which produces 170ps at 3,200-4,000 rpm, with peak torque of 400 Nm at 1,600-2,800 rpm. 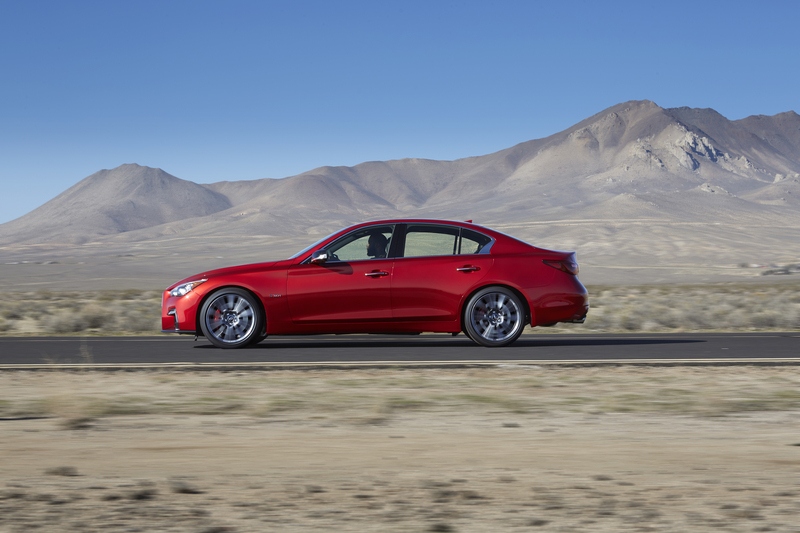 All 2018 Q50 powertrains come with an advanced seven-speed transmission as standard. It is an electronically controlled automatic transmission with manual shift mode and available steering wheel-mounted magnesium paddle shifters on Q50S 3.0t models. 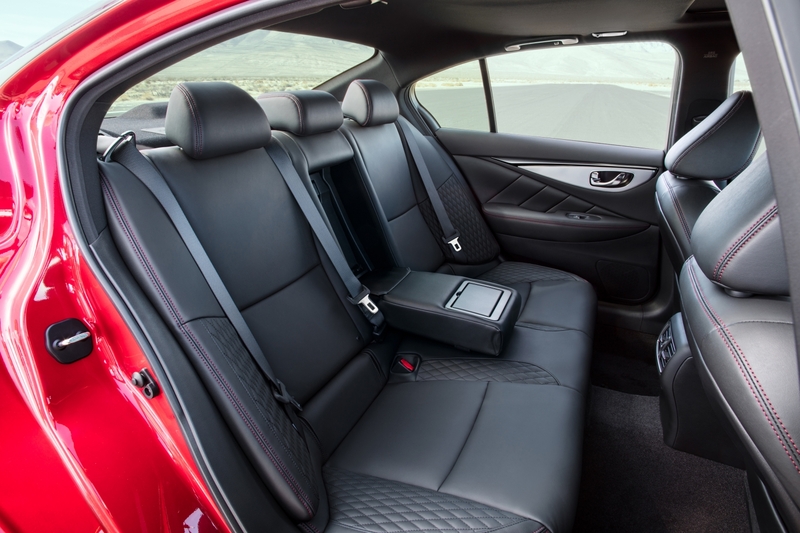 The gearbox features logic and hardware designed to handle the power output of the VR-series engines. 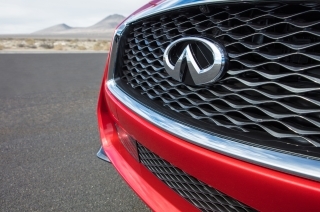 Dual transmission coolers are utilized to better diffuse heat. In addition, the Q50’s Adaptive Shift Control enhances gear selection by using a lateral acceleration sensor to detect changes in the road, such as hills and turns. 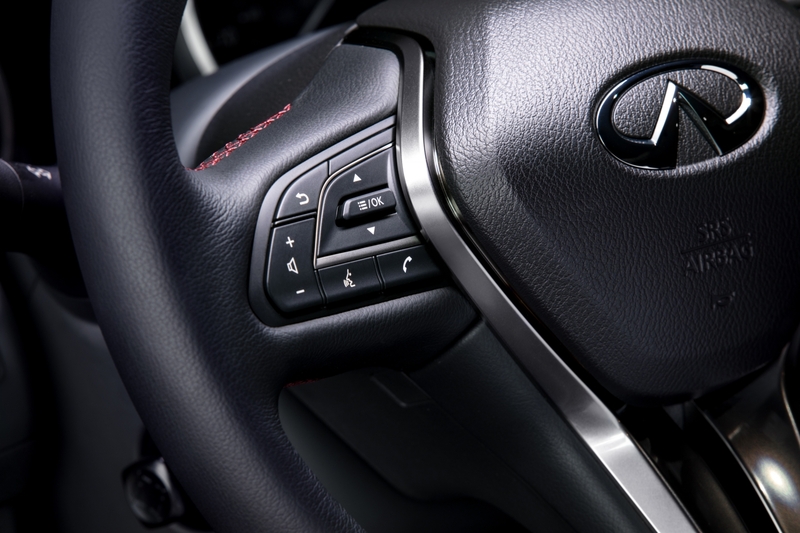 Sport Mode allows the driver to select a more aggressive shift pattern with automatic up- and down-shifting at higher rpm. 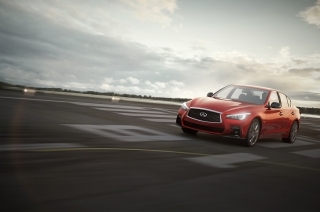 The Sport Mode allows a more aggressive shift pattern and higher rpm downshifting. 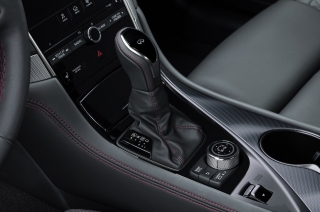 The combined effect is for any driver to enjoy quick, smooth shifts and gear choices that are appropriate to both the road and the desired driving style. On the 4-cylinder 2.2 diesel engine, a 6-speed manual transmission is also available. The 2018 Q50 can be configured with one of two driveline options – rear-wheel drive or Intelligent All-Wheel Drive. 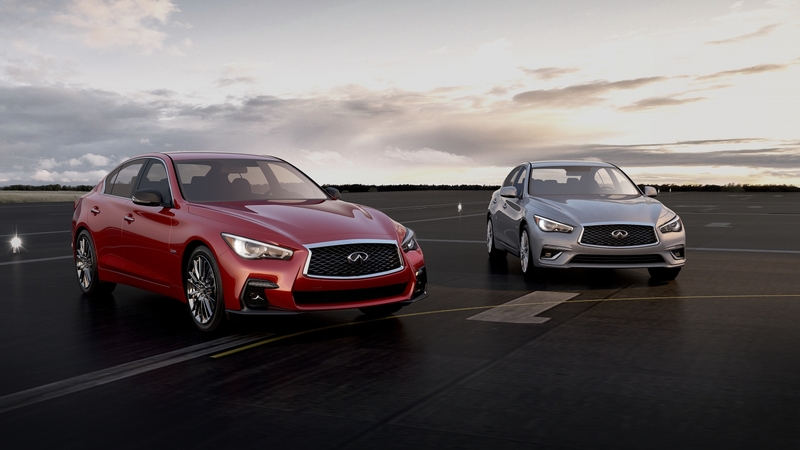 Both are available depending on the engine. The 2018 INFINITI Q50 also stands out from the competition with its second-generation INFINITI Direct Adaptive Steering, which is a precursor to future steering systems that will form a key building block on the way to achieving fully autonomous driving. 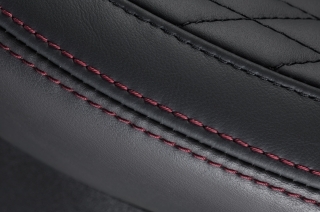 It comes standard on all SPORT grades and also on all Hybrid versions including the Hybrid Premium version. 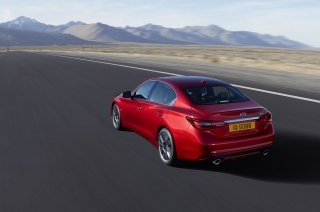 The Direct Adaptive Steering’s standard steering mode offers advanced levels of steering feel and feedback – more akin to that of a conventional steering system. 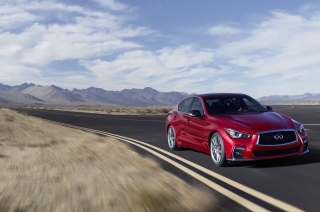 In addition, the system offers even more options to personalize and tailor the steering system’s levels of response and feel to suit the driver’s preferences (versus the previous generation). 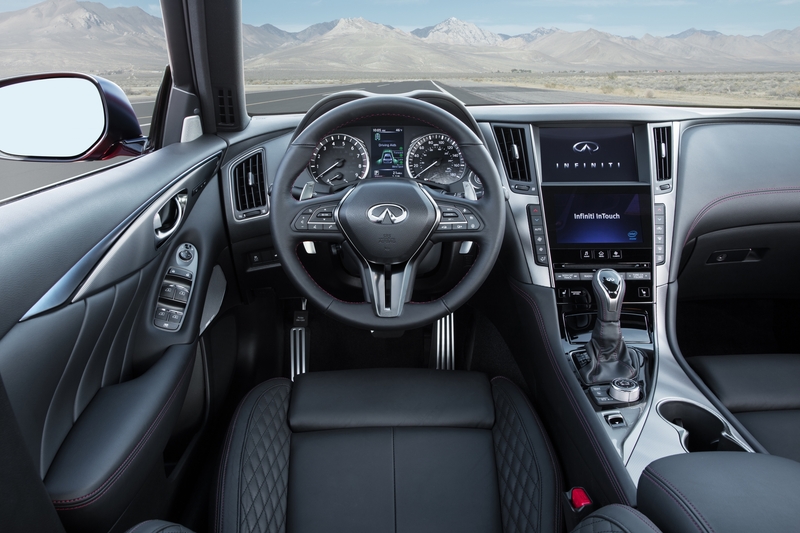 The system also provides additional customization options, fully utilizing the potential that Direct Adaptive Steering offers, giving to the driver flexibility to choose the level of steering assistance and feedback according to personal preferences. 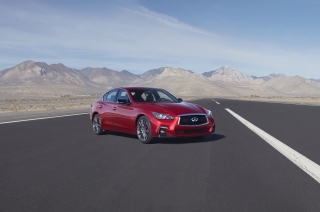 It actively adjusts the steering ratio and effort according to vehicle speed and scene. 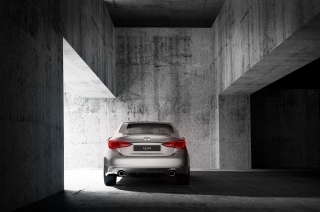 In slow-moving situations, such as city driving or parking, the system is tuned for ease of maneuverability. 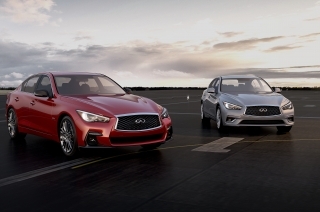 In order to further enhance the steering feel in sporty driving conditions, the steering effort gradually saturates with high lateral G-force and acceleration in line with the overall vehicle behavior. 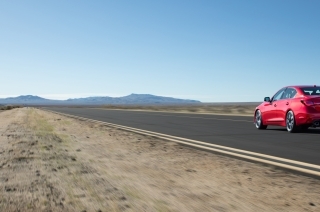 Direct Adaptive Steering is able to transmit the driver’s input to the wheels faster than a mechanical system while requiring fewer steering corrections and is able to make 1,000 steering adjustments per second. 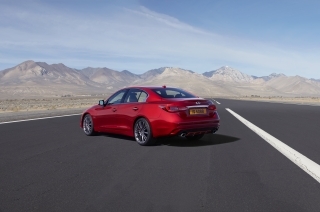 The system enhances the steering feel by quickly and intelligently communicating to the driver feedback about road surface and chassis behavior. 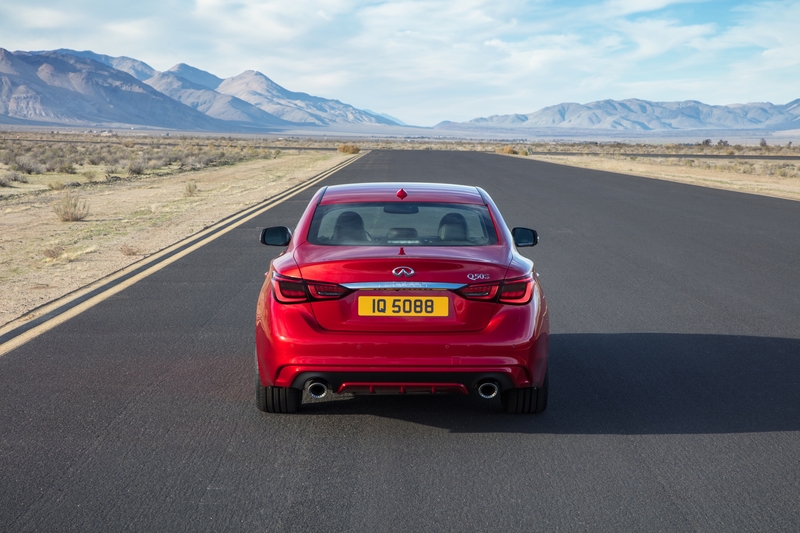 This gives the driver a secure and confident feeling at the wheel, free from unnecessary steering kickbacks or vibrations. 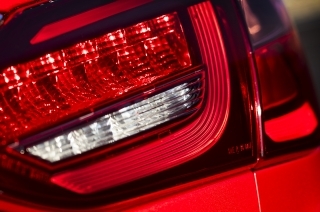 The elimination of unwanted feedback has the further benefit of reducing driver fatigue. 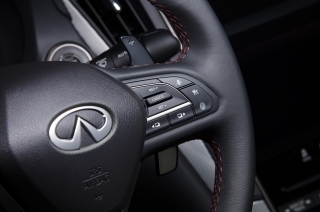 The expanded selection of steering modes within Direct Adaptive Steering is accessed through the Drive Mode Selector. 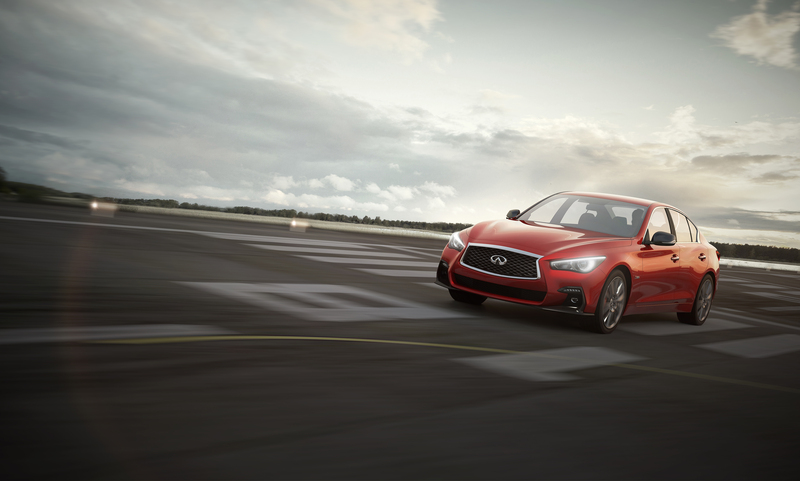 Direct Adaptive Steering works with Active Lane Control to maintain lane positioning against crosswinds and uneven road surfaces. INFINITI Q50 Base and Premium (except Hybrid) models feature a standard speed-sensitive hydraulic electronic rack-and-pinion power steering system. 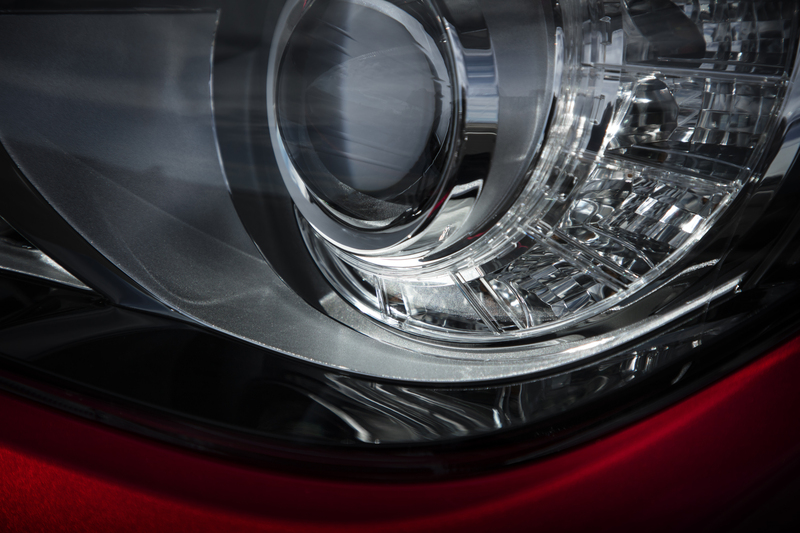 This system increases assistance at low speeds and reduces assistance for enhanced feel and response at higher speeds. 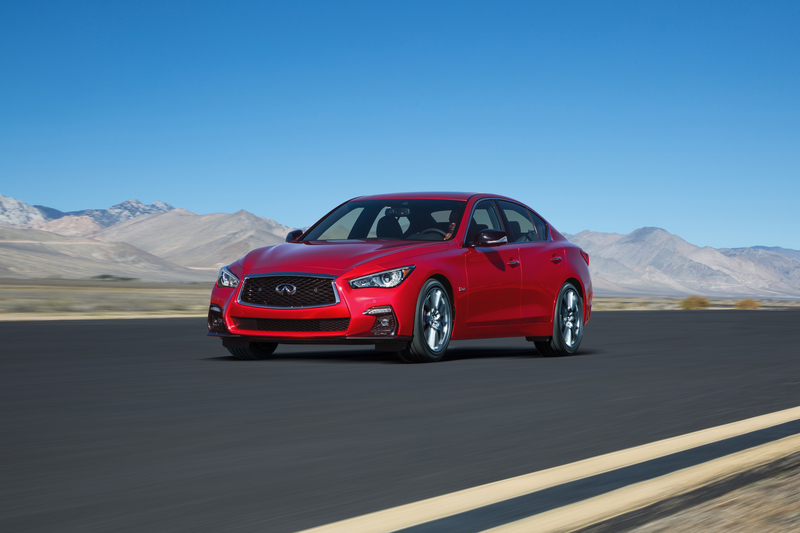 The 2018 Q50 also features an available Dynamic Digital Suspension. Available on Q50S 3.0t, it provides an optimal blend of ride comfort, response and agility. 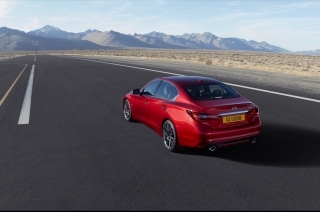 The shift from a comfort-biased ride to enhanced dynamic response can be made when the driver places the electronically adjustable shock absorbers in Sport mode (adjusted via the Drive Mode Selector), providing firmer damping control for more agile handling. While in these modes, the suspension is constantly adjusting to provide ideal performance and a flat ride. 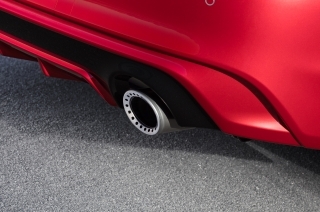 In all modes, Dynamic Digital Suspension also constantly adjusts the shock absorber valve within a wide range of damping force to control body motion when cornering. It monitors body roll, pitch and bounce rate to restrain body motion for a comfortable, confident and insulated ride in all conditions, ensuring that bumps and undulating road conditions are absorbed to maintain flat body posture. 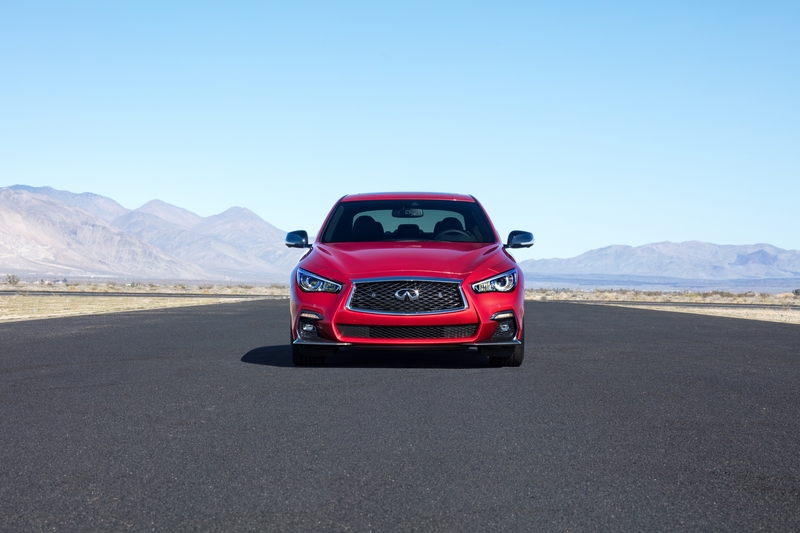 Every Q50 features a 4-wheel independent suspension that provides an improved balance between confident handling and a comfortable ride. 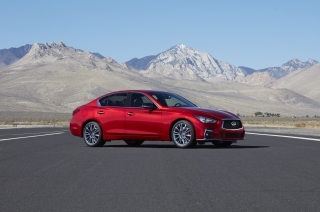 The front suspension is a double-wishbone design, while the rear suspension utilizes a multi-link design with coil springs and Dual Flow Path® shock absorbers (non-Sport and non-Hybrid models). 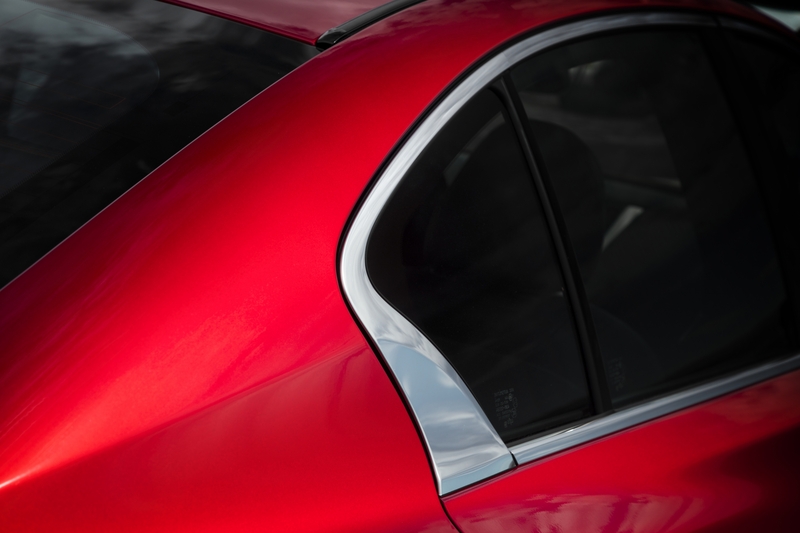 Extensive use of aluminum components for the suspension keeps weight down. The suspension also offers front and rear stabilizer bars. 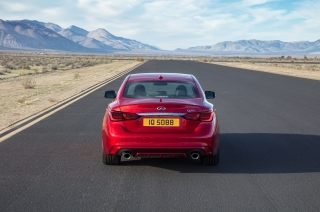 Braking is provided by a 4-wheel power-assisted vented disc brake system with 4-wheel Anti-lock Braking System and Electronic Brake force Distribution and Brake Assist. 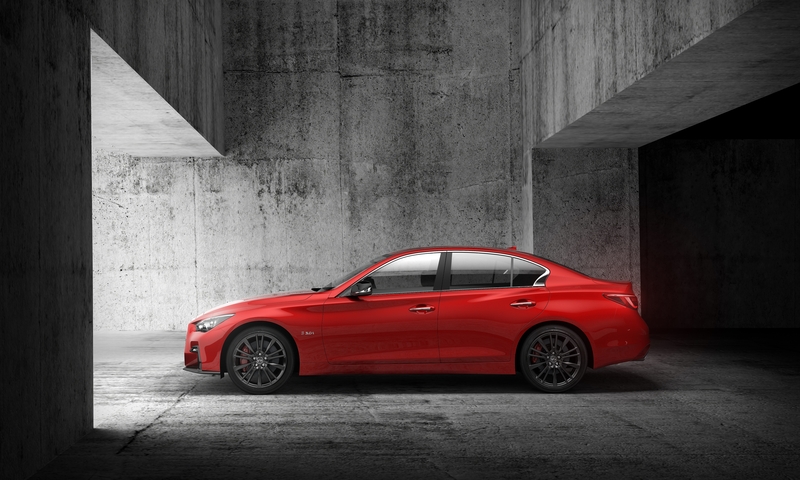 Sport Brakes with upgraded rotors, 4-piston front calipers and 2-piston rear calipers are standard on Q50S 3.0t and Q50S Hybrid SPORT versions, with red painted calipers on the 3.0t. 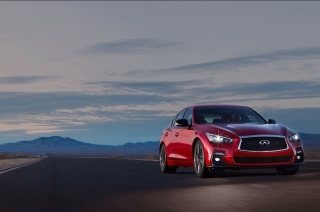 The 2018 Q50 offers a wide range of available models and equipment packages. The Q50 entry grade’s long list of standard features includes 8-way power front seats, Dual-Zone Automatic Temperature Control, INFINITI Navigation System with traffic information and Digital Audio Broadcasting (DAB), INFINITI InTouch™ and 17-inch aluminum-alloy wheels. 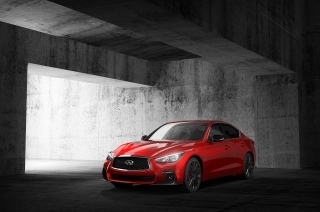 Q50S SPORT and SPORT TECH versions add a range of features such as the Multimedia Pack which includes INFINITI Navigation System and BOSE® Performance Series with 16 speakers, sports front fascia, aluminum-accented pedals, and sport-type leather-appointed seats. 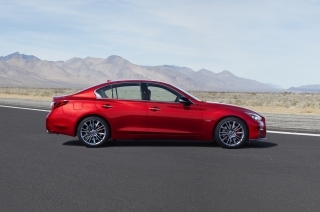 The ultra-performance 2018 Q50S 3.0t comes complete with quilted semi-aniline leather-appointed seats, dark chrome interior trim, dark metallic dynamic tactile paddle shifters, custom exhaust tips, sport brakes with red painted calipers, a full range of safety and driver aid technologies on the SPORT TECH version and, of course, 405ps. Completing the Q50 lineup is the Q50 Hybrid, with an array of standard comfort, convenience and safety technologies. 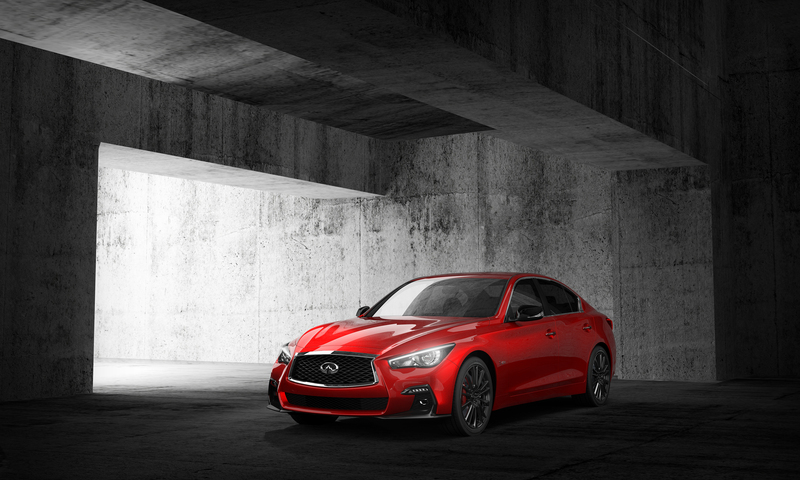 A number of special option packages are also offered, allowing drivers to customize the Q50 to their exact specifications. Packages include Comfort Pack, Visibility Pack, Welcome Pack, Multimedia Pack and Safety Shield Pack. 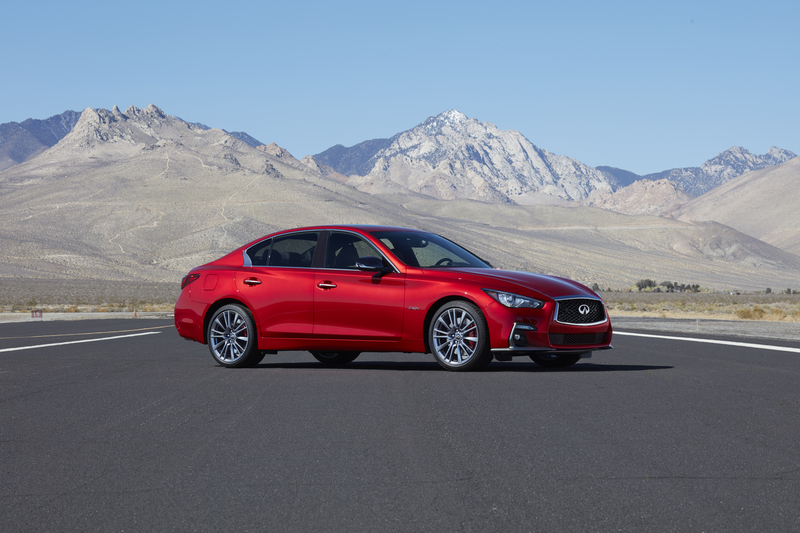 A range of wheel and tire combinations are available, starting with the Q50, Q50 Premium 17x7.5-in. 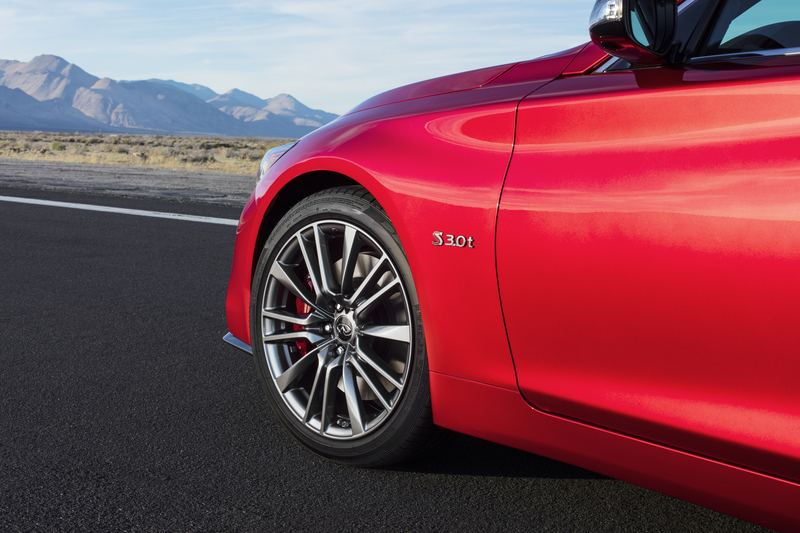 split 5-spoke machine surfaced aluminum-alloy, wheels with 225/55R17 summer run-flat tires. New 18x7.5-in. 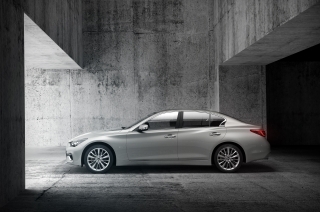 5 spoke alloy wheels in metallic silver color, machine finished with 225/50R18 summer run-flat tires are proposed optional on Q50 Premium grade. 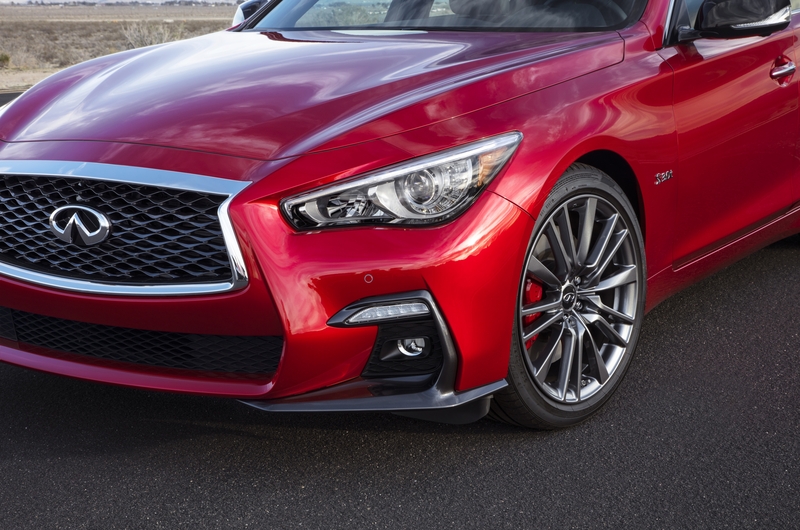 Available with the Q50S SPORT and SPORT TECH grades, are 19x8.5-inch triple-spoke alloy wheels in dark metallic silver color in sport design with 245/40R19 summer run-flat tires. 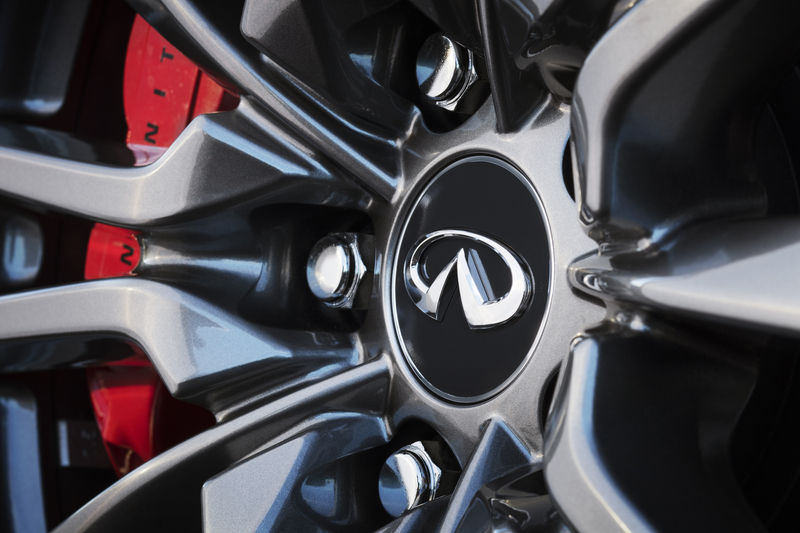 The Q50S 3.0t features triple-spoke alloy wheels in light metallic silver color with unique design with 245/40R19 summer run-flat tires.